Certainly one of the most impressive marine predators, the great hammerhead shark has a very distinctive appearance. This “imposing” shark can measure up to 20fts and 1500 lbs. Its large and flat head offers it perfect stability. It is distinguished from other hammerhead sharks by the large size of its dorsal fin. Its grey-colored body is massive. 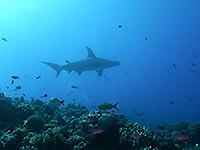 The great hammerhead shark can be found in most tropical oceans, in the Red Sea and the Mediterranean. This species commonly lives in deep-sea: it is a real luck to meet this shark close to the coasts. It is all the more difficult to encounter this shark when you know that it is mainly active at night. This solitary species can live as deep as 330 ft. This shark can be found in most tropical oceans, in the Red Sea and the Mediterranean. This species commonly lives in deep-sea: it is a real luck to meet this shark close to the coasts. It is all the more difficult to encounter this shark when you know that it is mainly active at night. This solitary species can live as deep as 330 ft. The reproduction of the great hammerhead is still full of mysteries. We just know that after a gestation period of 10 month females give birth to approximately 40 little sharks of about 60cm. It should be noted, nevertheless, that a hammerhead shark has already given birth without mating with a male (parthenogenesis). This auto-reproduction happened in a zoo in USA. Each year in summer, we can asset to a large migration of hammerhead sharks somewhere next to the coasts of Malaysia … still a mystery to man. Victim of overfishing, this shark is a protected species since March, 2013. 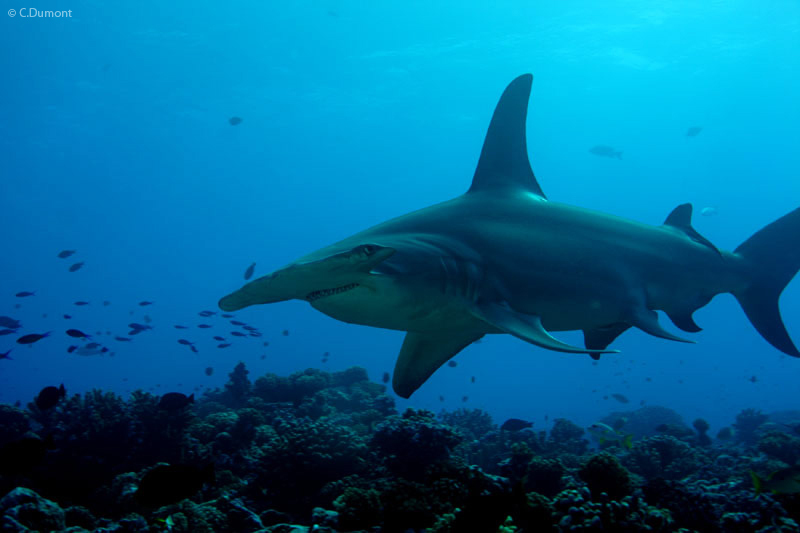 In French Polynesia, you have a better chance to encounter the great hammerhead shark in the Tuamotu archipelago. You could cross its path during your dives in the passes of Fakarava and Rangiroa, especially in the Garuae pass where it became the master of the place. A really breathtaking encounter! !